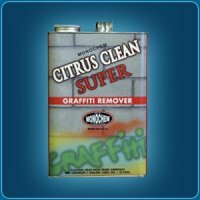 CITRUS CLEAN SUPER is a concentrated, heavy duty, easy to use, water-dilutable graffiti remover that does not contain methanol, methylene chloride or other prohibited solvents. CITRUS CLEAN SUPER is used to remove and clean graffiti from surfaces that are protected with PERMASHIELD PREMIUM Graffiti Control System. 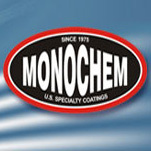 It is safe to use on vinyl composition tiles, ceramic tiles, terrazzo and marble. Do not use on asphalt tile. To ensure suitability and desired results conduct a test on each surface type before application. DO NOT DILUTE. Use CITRUS CLEAN SUPER as-is over PERMASHIELD PREMIUM. CITRUS CLEAN SUPER may be applied by brush, roller or sprayer. Apply it directly on the graffiti markings and allow it to set for 2-3 minutes. DO NOT ALLOW CLEANER TO DRY ON THE SURFACE. With a nylon hard bristle brush or scour pad, scrub the cleaner into markings. Spray on more cleaning solution, as needed, to maintain a wet surface and to remove the dissolved markings. Continuous wet scrubbing will remove the graffiti. After the complete removal, rinse the cleaned area well with water. 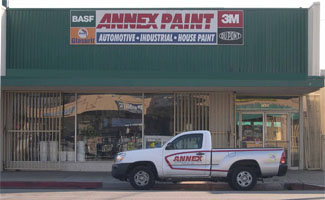 Textured surfaces and imbedded stains may require a repeat application. Protect the surrounding vegetation, foliage, painted surfaces, and non-masonry materials from the splashing of the cleaner residue. Maintain good ventilation when working indoors. COMBUSTIBLE. Do not smoke when using CITRUS CLEAN SUPER. Keep out of reach of children. Harmful if swallowed. Can be absorbed through the skin. Avoid prolong exposure with skin. Protect the eyes and skin by wearing protective eye wear, clothing and gloves. Wash items thoroughly after handling. Refer to the CITRUS CLEAN SUPER MSDS for complete information. Skin Contact: Wash with soap and water immediately. Eye Contact: Flush with plenty of water for 15 minutes. Get medical attention. Ingestion: Induce vomiting and get immediate medical attention. Inhalation: Remove person to fresh air. Give artificial respiration if not breathing. Get immediate medical attention.